Genoa’s legendary pesto has spanned many centuries to come intact here. The town is a colourful combination of skyscrapers and ancient landmarks dedicated to Christopher Columbus and Nicolo Paganini. 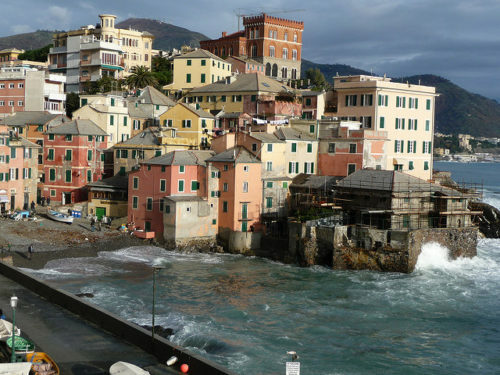 The “old town” has still its fascination.The most powerful port in Europe centuries ago, the second largest one today, Genoa is rich in history and a pretty health port, encased within the precious medieval walls that still make up the city’s heart and soul. On the Ligurian Sea, Genoa is the capital of the Italian Riviera, with its buildings from cascading hills,fantastic renovated funiculars which climb from downtown piazzas towards the “citta’ alta”. From here the sightseeing is breathtaking: the busy port and the immensity of the Mediterranean sea. During the summer, hour-long harbor cruises are available from the city. The hills add a certain touch to the town, with mysterious alleyways diverting in every direction!!! The bars, cafes and the clubs are located along the harbor pffering a wide choice of wine and fun. The medieval town with ancient buildings has been declared as World UNESCO site and they slowly transform into structures which has been built during the Renaissance period. As Genoa in the past was a marine Repubblica, the city accumulated power and wealth, building opulent palaces, spreding marble in the streets and creating fantastic gardens which still are visible along the outskirts of the country. One of the highlights and most interesting attractions in Genoa is the Acquario di Genova (Genoa aquarium), the largest collection of marine life in Europe! Built to honour the memory of Christopher Columbus, which was a “Genoan DOC”, the Genoa aquarium appearead as a giant ship preparing to set sail. Its tanks hold over a million gallons of water and the many exhibitions explore the sea life found in the Ligurian Sea and the acquatic rest of the world too. Here come with the family and the children to visit the sweet dolphins!!! Besides Columbus, who is the most famous person born in Genoa? The maestro Nicolo Paganini, the finest violinist of every century. Nicolo Paganini’s instrument aka his violin is still on display at the Palazzo Tursi, which also offer to the visitors many of Columbus’s handwritten letters. This entry was posted on Saturday, January 12th, 2013 at 7:32 pm	and is filed under Italian Recipes and Food. You can follow any responses to this entry through the RSS 2.0 feed. You can leave a response, or trackback from your own site.